Blue Raster is proud to attend our 16th Esri User Conference in San Diego! This year we have teamed up with the National Arbor Day Foundation to replant our national forests. 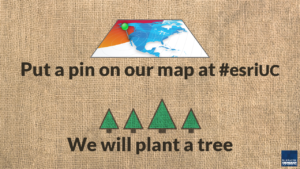 Place a pin on our map at #EsriUC, and we will plant a tree in Tahoe National Forest. Be sure to come check out Blue Raster at booth 2215, near the Sustainable World Showcase! Meet the Blue Raster team, learn about our mapping applications, plant a tree in Tahoe National Forest, and more! Before you arrive, check out esri.com/events/user-conference/agenda for a complete schedule of events. We look forward to seeing everyone and all of the latest mapping trends and technologies, stop by our booth and say hello! Please also “Like” Blue Raster on Facebook for photos and more in-depth news from the conference and beyond.